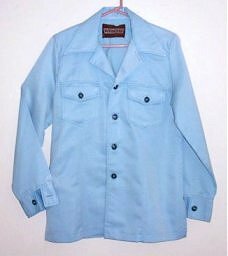 This is an original vintage 1970s Shirt Jac. They were worn either closed or open like a leisure suit jacket. It is 100% lightweight polyester, not double knit, is baby blue and it has a fly collar. This piece looks much more impressive in person than my photo indicates. The fabric has a bit of a sheen to it and the jacket has contrasting stitching and obvious front seams, not to mention the giant fly collar. Its wonderfully cheesy 70s style stands out more in person. It has a thin synthetic lining and is machine washable. It has hardly any sign of wear and no spots. It does have one very hard to notice little hole near a seam around an elbow. The "hole" doesn't "show through" because there is fabric behind it that lines it. Since it is right next to a seam on the back of the arm it really is barely noticeable. By today's standards it would be a Med.-Large of Regular length. This would look great with navy blue or white polyester pants, although it would blend with denim or black as well. Matching white or black 3 holed wide leather belts available. Order further down. Sale is final during month of October.